to the Webmaster via our e-mail link. designed to be a free advert to sell a vehicle. Guest: LEE GOLDRING -- CAIRNS QUEENSLAND. Long time follower, first time caller. This is my newly acquired 1955 Mainline. It runs a 351c, C4 Automatic and 9" diff. It has been fitted with A/C and soon to have a rack and pinion set up installed. I have only recently purchased it and absolutely love it. We have a small collection of Muscle cars and bike but for some reason this beauty has me feeling like a kid in a lolly shop. It is straight and extremely clean with absolutely no rust and apart from the workout when parking it. It starts first turn of the key every time and sits on the road sensationally. There are areas that need a little TLC, like replacing tail light lenses and minor things like that. But apart from them Mannie is as solid as a rock. Only sorry I am in Nth Queensland and unable to be part of your Club, but always looking for updates on your Club web site. 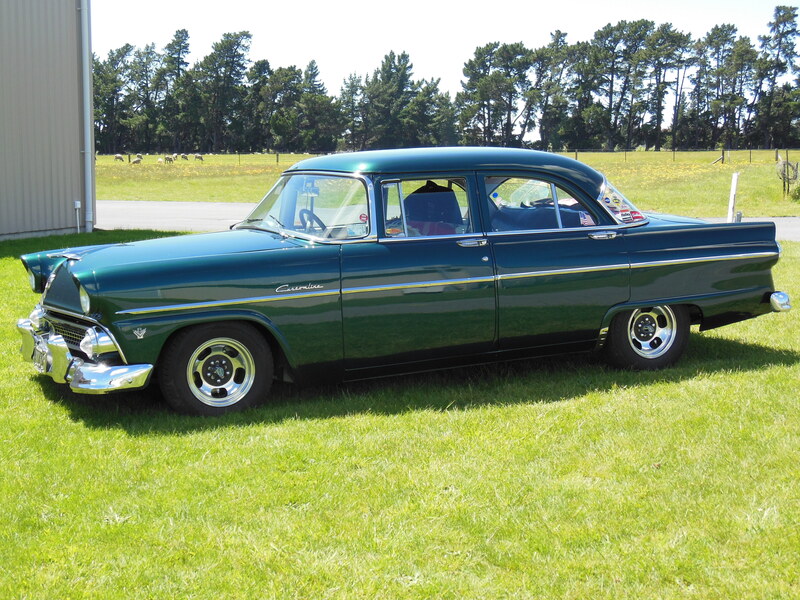 Wondered if you would like to feature my ’55 Cussy on your Guest Profile page. Attached is a photo, and I’ve also produced a video entitled “St Kilda by Customline”, which provides some info about the car, at the same time as a mini guided tour of the streets of St Kilda. 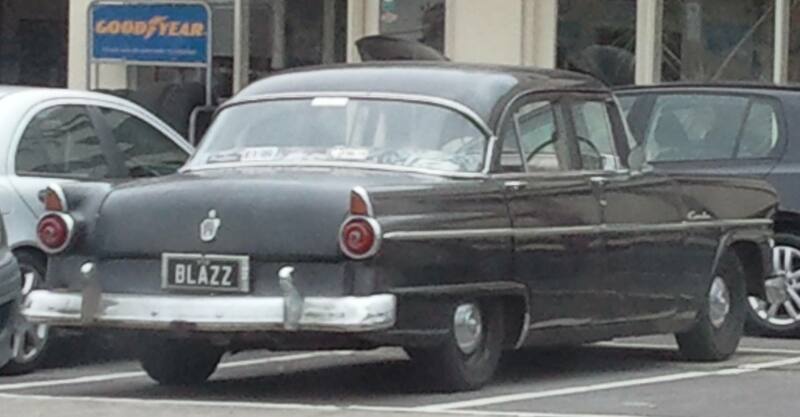 The car was originally a mourning car at the funeral parlour in Albany (WA). I bought it in Perth in 1989, and it has never been restored or significantly modified. Steering and brakes are original, and it has the original 272 Y block (reconditioned in 1990). There are a few modifications eg, 12 volt electrics and twin exhaust system (T-bird exhaust manifolds), and electronic ignition (recently installed by Bentleigh Garage). wheels with cross-ply tyres on them. PS. Second picture was taken with phone camera at Bentleigh Garage, from across the road. Ed. This is a better photo. Since the last one I have fitted Falcon discs which dropped the front. I have been following your progress and the Club seems to be going strong. Got my clubs 40th next weekend, (Sun Valley Roadsters). Then will pull the 460 out and do the engine rebuild. Just going to build a zero to five thousand RPM rev range engine, might as well use the torque. Great site and love the cars. Looks like you do a bit around the place and have a good social thing going. As you may have guessed I am a Cusso fan and have owned the one I have now since 1974 and have no intention of parting with it. It is like your grandads cricket bat, 3 handles and 2 pads. When I bought it in 74 it was all origonal, it has had a 272, 351w, now 460 big block (last 20yrs). Now I am fighting the nostalga bug and keep leaning back towards the Y Block. At present it has a trick shifted C6, but has had Humber Super Snipe 4 speeds and a C4 at one stage, a total of 7 gear boxs over the years. The diff is a 31 spline 9in 2.75 ratio to get 20mpg. I have always found the brakes good but have just fitted a VH44 to boost them as I am getting soft. I have put your site on my favorites so I will keep looking. 49-59 FORD CUSTOMLINE CAR CLUB OF VICTORIA Inc.